I would like to use an Atmega328p micro-controller with a 4 Mhz oscillator in order get some low power consumptions. I am using an Arduino board to flash the bootloader into the Atmega. 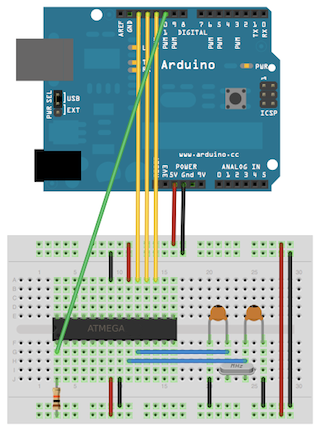 HELPTEXT += "target atmega328     - ATmega328p 4Mhz\n"
Uploaded the ArduinoISP sketch onto the Arduino UNO board. Select "Arduino Noize" from the Tools > Board menu. When I try to upload a sample sketch (blink) using the wiring below I get a timeout from the IDE. I have double checked the connections but the sketch doesn't upload. Do you have any advice? As Gerben notes in the comments, the bootloader has to know how fast the board is running. It uses this to work out the baud rate settings for the serial communication. If you haven't compiled the bootloader yourself with the right clock settings you will probably find that it is operating at a quarter of the speed you expect it to. Dividing your upload baud rate by four in your board settings may make it work, but you really should compile the bootloader to match the board properly. As mentioned before, you need to compile the Optiboot bootloader with the correct clock frequency. Here's a guide that shows you how to do that, as well as adding an option to the Arduino IDE menu to select the right clock speed without having to add your own board definition. Low fuse byte bits 3,2,1 determine the clock source 110 = low power crystal oscillator in 3-8 MHz range. So those settings look okay. Not the answer you're looking for? Browse other questions tagged arduino-uno arduino-ide atmega328 bootloader oscillator-clock or ask your own question.